On the Scorpio, the mid-deck is the main working deck, containing the engineering, galley and crew cabins, as well as the operating arms. Forward workshops: Fading Sun is still a salvage vessel. This area contains a sophisticated workshop, storage supplies for the galley and the machinery  needed to operate the two forward grappling and recovery arms. Spare tanks of Oxygen, and other necessary supplies are also stored here in small wheeled supply cases. Access Point: A lift leads down to the cargo deck. Next to this is a set of secured stairs that leads up to the Bridge compartment. Opposite, on the port side, is the set of stairs that leads down to the cargo deck. 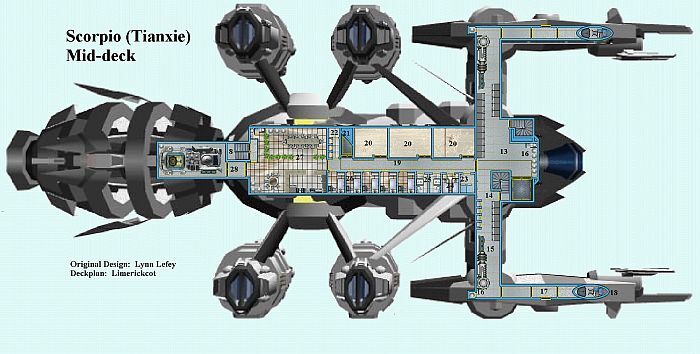 Lifepod Stations: Found throughout the ship, each station leads to two pods, which can be jettisoned in case of an emergency, operating a powerful beacon. Starboard and Port Grappling and Recovery Arms: An airlock  is located halfway down each arm. The internal areas of the Arm access space is covered with the controls, tubing and electronics of each arm, The area just outside the airlock has racks for spacesuits, eva and tools. Forward of the airlock, another hatch leads to the access for each arm's control `bubble' , which is accessed through a roof hatch. Each control `bubble' (which can be remotely operated from the bridge if needed) has fine controls and space for just the operator. The `bubble' controls the fusion cutters housed in each arm and the fine manipulators. Crew Compartment:  A large hatch leads into this area, fitted flush to allow the easy movement of cargo from the vaults down to the cargo decks. Linen and wash room, equipped with a washing machine and tumble dryer. five single crew berths, each with a bunk, computer terminal and drawers/wc. `Vaults', or high security cargo compartments. Galley: Another flush secured hatch leads to the Galley. The eating area is split in two. One for crew and one for passengers, although the latter only tends to get used when carrying a maximum load. A simple washroom is provided. Stairs  lead down and up and has an extra door to prevent access outside of mealtimes. Engineering: The main engineering compartment powers Tianxie. Many of the subsystems are split around the ship, but this is the heart of the vessel. Life support is located forward.